Stephen M. Johnson is a Professor of Law at Mercer University Law School in Macon, Georgia. He received his J.D. from Villanova University School of Law and an LL.M. in environmental law from the George Washington University Law School. Prior to teaching, he served as an attorney for the Bureau of Regulatory Counsel in the Pennsylvania Department of Environmental Resources (now DEP) and as a trial attorney for the U.S. Department of Justice, Environment and Natural Resources Division, Environmental Defense Section, where he worked on environmental litigation. 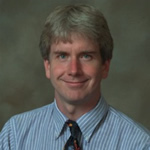 He joined the Mercer faculty in 1993 and served as the Associate Dean for Academic Affairs from 2002-2012. He specializes in Environmental Law, but has also taught Torts, Statutory Law, Administrative Law, and Dispute Resolution. His scholarship focuses on wetlands, environmental justice, economics and the environment, technology and the law, and administrative law. He has authored several CALI exercises on environmental law and has served on the Board of Directors of CALI since 1998.